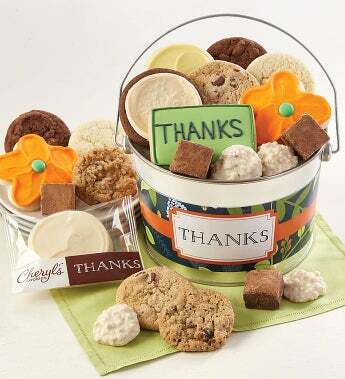 Send a sweet treat to say thanks with our shiny silver pail overflowing with Cheryl’s goodies. We’ve included snack size cookies and brownies, buttercream frosted cookies, a hand decorated crunchy thank you sugar cookie and sweet and salty pretzel clusters. Kosher. Send a sweet treat to say thanks with our shiny silver pail overflowing with Cheryl's goodies. We've included snack size and brownies, buttercream frosted cookies, and sweet and salty pretzel clusters. Kosher.